Social media marketing of any business or posts or events can be done on Facebook, Twitter, Linkedin, Youtube and Blog. Social media is platform to participate in social networking. 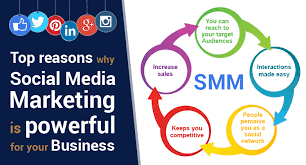 Main reason to use social media marketing is that it is very flexible, effective and fast. It will also improve business, website ranking in search results which in turn generate traffic and sales. To benefit from social media marketing, Main strategy is to set clear Goals, Objectives and Plans. Be Specific, Measurable, Achievable, Realistic and Time bound. Always explore competitors Pages, Plans and Posts, Check current market and trends. Explore new and try more social media platforms, Commonly used are twitter, facebook, linkedin, instagram, youtube. Choose core topics and main keywords of your business. Aim for good reputation by posting original and good content of your business and achievements. Try to analyse competitor page and post exact or new innovative posts to encourage more engagement and sharing. Be like good and honest business on social media, As people search for good reviews online. Include your business key concepts and milestones on front in your social profile and page. Add clear exact address with google maps, Also with call to click or contact button. List your renowned vendors on website and social media for good confidence in customer. Post in other relevant Groups, Forums and Pages with hashtags for more engagement.